Since the start of the Missouri State Highway Patrol, thirty-one officers have made the ultimate sacrifice and given their lives in the line of duty. Below, you can see a brief summary concerning the death of each of those thirty-one officers, plus the only Missouri State Trooper to be killed serving his country during World War II. We list these officers and their stories so that we will never forget the sacrifices they made for the Patrol, the people of Missouri, and all who travel our highways. 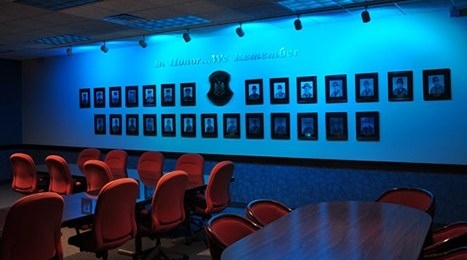 The photo depicts the Wall of Honor, the Ultimate Sacrifice, which presides over the Executive Board Room of the Missouri State Troopers Association, illuminated in blue.